Before you download the Klout app for your Apple device, you need to sign up for a Klout account. Then you can download and sign in to the app. 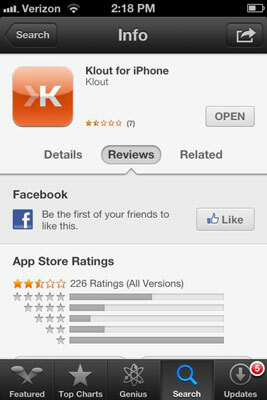 Search for the Klout app by opening the App Store on your mobile device. 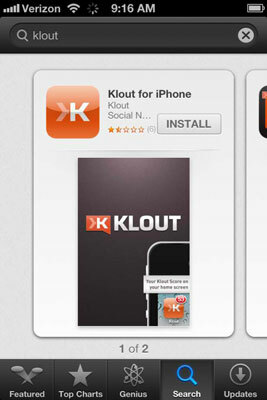 Make sure the app you choose has been developed by Klout, and you can get started! Using your Apple device, open the App Store and tap Search from the options at the bottom of the screen. Enter Klout in the search box. 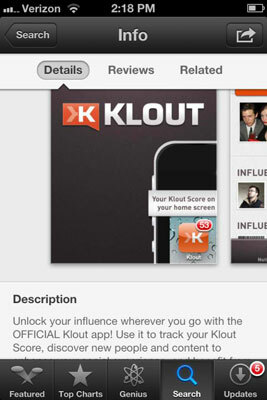 Select Klout for iPhone (or iPad or iPod touch) by tapping the screenshot of the Klout logo. Here, you can view the app details and read consumer reviews from other users to decide whether you wish to install this app. If you decide to add Klout to your mobile device, the process is simple. Downloading Klout to your Apple device is as simple as tapping the Install button. The installation process may take a couple of minutes. Afterward, the app appears on your home screen. Then simply tap the app icon to open the app and get started.